Self Transport Folding Wheelchair with Footrests, Solid Castors and Large Rolling Rear Wheels. 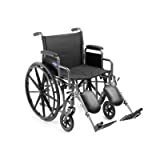 SPECIFICATIONS SEAT WIDTH: SEAT WIDTH: 19" | SEAT DEPTH: 16" | SEAT TO FLOOR HEIGHT: 19.5" | WHEEL-TO-WHEEL WIDTHS: 25" | ARM STYLE: FULL-LENGTH | NEWLY DESIGNED 8" FRONT CASTERS WEIGHT: 39 LBS WEIGHT CAPACITY: 250 LBS. PLEASE NOTE THIS ITEM CURRENTLY CAN ONLY BE SHIPPED TO A PHYSICAL STREET ADDRESS WITHIN THE 48 CONTIGUOUS US STATES, WE APOLOGIZE FOR ANY INCONVENIENCE THIS MIGHT CAUSE. ELEVATING AND SWINGAWAY FOOTRESTS (DETACHABLE). DETACHABLE DESK ARMREST. 8" FRONT CASTERS AND ENLARGED 24" REAR WHEEL WITH SOFT-GRIP TIRES. TOTAL DIMENSION IS 36"(H) X 27"(W) X 30"(D - WITHOUT FOOTREST). 18"(W) X 16"(D) BLACK NYLON UPHOLSTER SEAT, SEAT TO FLOOR HEIGHT IS 19". TOTAL WEIGHT IS 49 LBS (WITH FOOTREST ATTACHED). 250 LBS WEIGHT CAPACITY. LIFETIME FRAME WARRANTY。 1 YEAR ON ALL OTHER PARTS. SOME SHIPPING RESTRICTIONS APPLY TO THIS ITEM, PLEASE SEE BELOW. PLEASE NOTE THIS ITEM CURRENTLY CAN ONLY BE SHIPPED TO A PHYSICAL STREET ADDRESS WITHIN THE 48 CONTIGUOUS US STATES VIA STANDARD SHIPPING, WE APOLOGIZE FOR ANY INCONVENIENCE THIS MIGHT CAUSE. Self Transport Folding Wheelchair with Footrests, Solid Castors and Large Rolling Rear Wheels. out of 5 based on ratings.